#mondayinspiration || 9 WAYS TO GET THE CHAMP IN YOU RUNNING! Every Individual is faced with different opportunities that help in shaping the champ in such person. What you do to get that champion running is what sets you apart from every one else. Today's #mondayinspiration post is focusing on stringing to be great in wherever you find yourself. A mediocre life is not what we need to achieve that 'champion' level, we need to give it a little more to push us forward. 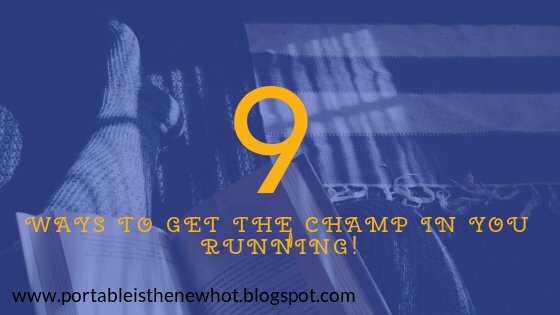 I have put together ten (10) points that will get he champ in you running! Stay with me. 1) Know Your Worth: You need first understand that you're of great value, and that you deserve to be the best in everything you do. Don't look down on yourself, look for ways to boost your confidence and self esteem and get the ball rolling! 2) Take Charge: It's time for you to dominate and take charge. A mediocre person cannot take charge of anything, a person who procastinates cannot take charge as well, you need to break free from the ordinary life and start taking charge. 3) Find What works For You and Do It Your Own Way: It's important for you to find what works for and not what works for another person. We all have different dreams and passions, doing something because you see it working for somebody, and you think it will work for you might not always be the right decision to make. Do you! 4) Set You Eyes On Goal And Don't Look Back: Great People are always very focused. They do everything within their power not to get distracted because then, it limits their chances of getting to their desired level. Focus on the end result and don't be distracted. 5) Always Say Positive Things To Yourself: The power of life and death lies in the tongue, so also the power to succeed or fail. Words are very powerful especially what you tell yourself. It has a power to either lift you up or bring you down. The mouth Propels change, so whatever you want in your life, speak it into existence. 6) Be Time Conscious: You might think that there's a whole lot of time to do whatever it is you want to do in life, but in the real sense, there isn't any time. Time waits for no one, once the time allocated for a particular goal is gone without achievement, it sets us behind. All we have is now, work and walk towards your goals and aspirations. 7) Keep The Hope Alive: Where there is life, there is hope. Sometimes we get so stressed out and it's almost as if everything is against us and nothing seems to be working. We all need a little hope to keep us going, provided there is hope, there is a possibility. Hope is the vehicle for future attainment. 8) Focus and Mind Your Business: A champ has no time for dilly-dally and idle ramblings. You need to learn to mind your own business if you want to get to the top. One wrong interference can cost you everything you've worked so hard for. The moment your focus becomes divided, your growth becomes stunted. Work on yourself and make yourself better. 9) Let Your Success Make The Noise For You: Don't be that person who announces every little feat, calm down and let your success make all the house. I trust you've been inspired. What other tips would you recommend? I would love to know your thoughts. Unleash the champ in you and have a great week ahead! The mediocre life is not what a success-minded person needs. This post was perfectly curated.